How many Naturalized citizens are living in the U.S. and their countries of origin. Well DHS doesn't track that (only the naturalization stats for each year, no tracking census of naturalized citizens) and the census doesn't track that (they don't ask those pesky citizenship questions).. So I am still looking for the definitive information. We sort of know how many foreigners are in the country and where they came from and we know the some of them are naturalized. But we really don't know how many foreign born naturalized citizens total there are. Just a heads up - the government is pretty much don't ask don't tell the american people who is naturalized or not. So what about the Naturalization service? shouldn't I be able to get numbers from them? Well they don't really want us to know too much. Big Mama will take care of all that. I am sure the 2010 census will make it all clear as mud. Who are considered foreign born? The U.S. Census Bureau uses the term foreign born to refer to anyone who is not a U.S. citizen at birth. This includes naturalized U.S. citizens, lawful permanent residents (immigrants), temporary migrants (such as foreign students), humanitarian migrants (such as refugees), and persons illegally present in the United States. The foreign-born population includes anyone who was not a U.S. citizen or U.S. national at birth. Respondents who are not U.S. citizens as well as those who have become U.S. citizens through naturalization are considered foreign born. 1 Includes respondents who reported their county of birth as China, Hong Kong, Taiwan, or Paracel Islands. Most of the foreign born who are American Indian and Alaska Native or Some Other Race are from Central America. Of the 127,000 foreign born in the American Indian and Alaska Native population, 77 percent were born in countries in Central America (Figure 4). Most were born in Mexico. 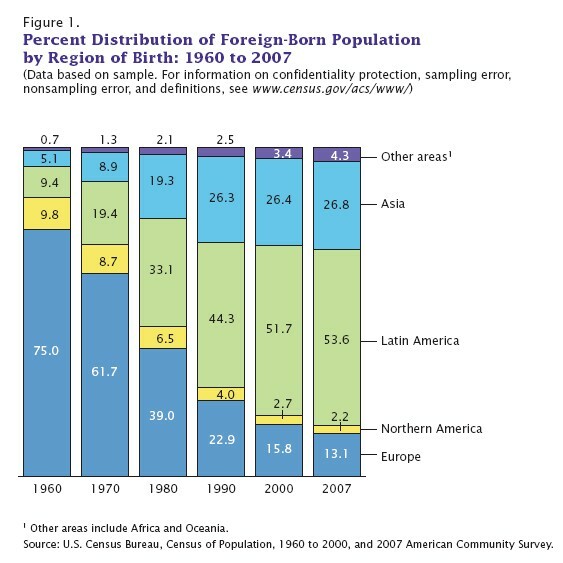 Census data provide a cross sectional snapshot of the foreign-born population or â€œstockâ€� living in the United States at a given point in time by citizenship status and year of entry. These data measure the proportion of the foreign born population at a point in time that is naturalized. However, this does not provide an indication of the frequency with which immigrants are naturalizing. The numerator â€“ namely, the naturalized citizen population â€“ consists of the survivors of same-year entry cohorts of immigrants reduced by mortality and emigration. The denominator â€“ namely, the total foreign-born population â€“ includes many noncitizens, such as temporary workers, foreign students, and undocumented immigrants, who are not eligible to naturalize as of the survey date. Thus, the denominator does not exclusively capture the subset of the foreign-born population that is at risk to naturalize. Stock: The population at a point in time. Example: the number of naturalized citizens residing in the United States on January 1, 2004. Using the most recent statistics from the Department of Homeland Security's 2009 Yearbook of Immigration Statistics, the US Census Bureau's 2008 American Community Survey, and other sources, the Migration Policy Institute has updated its immigration data for the United States on its Data Hub. The tool allows you to chart current and historical trends regarding the number and origin of immigrants who reside in the United States, as well as naturalization and green card statistics. While the United States accounts for 5 percent of the world population, it is home to about 20 percent of all international migrants. Fluttering American flags and patriotic songs are staples of the citizenship ceremony in the United States, home to 16.2 million naturalized citizens in 2007. There were 16.2 million naturalized citizens in the United States in 2007. Of the 38.1 million total foreign born in the United States in 2007, 16.2 million (or 42.5 percent) were naturalized citizens, according to 2007 American Community Survey (ACS) estimates. In 2007, an estimated 8.15 million lawful permanent residents were eligible for naturalization. According to the latest available OIS estimates, there were 12.78 million lawful permanent residents (LPRs) who resided in the United States as of January 1, 2007. Of them, 8.15 million were eligible to naturalize in 2007.